I’m a New Yorker! Well, at least I’ve been one for the past 20 years! And I couldn’t be a “real” New Yorker if I didn’t appreciate pizza. So, appreciate pizza I do. This autumn-inspired, Meatless Monday-friendly version is no exception! 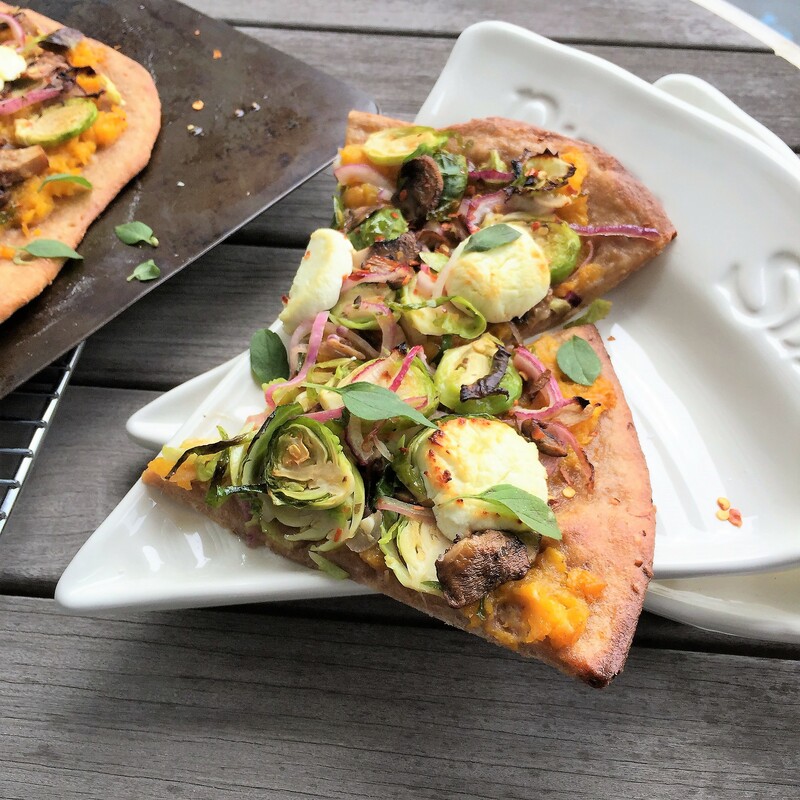 Not only are these scrumptious slices loaded with seasonal farmers’ market goodies, they’re full of good-for-your gut benefits. (As luck would have it, “good gut health” is this month’s Recipe Redux theme, too!) This recipe is rich in prebiotics—which feed friendly bacteria in the gut. 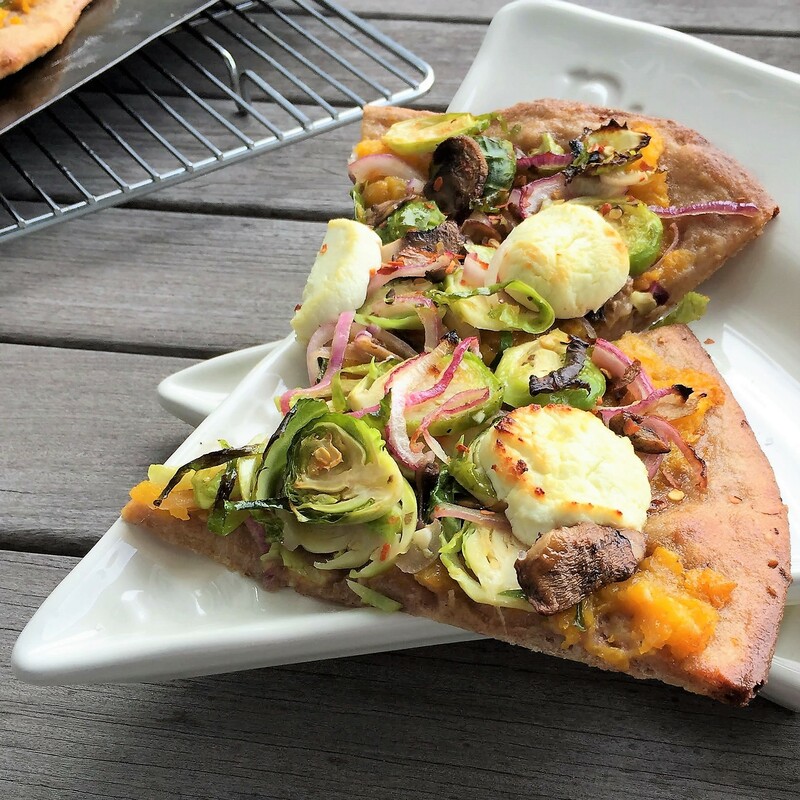 Since gut health is connected to immunity, enjoying this pizza wouldn’t be the worst way to try to fend off a cold or flu this season! 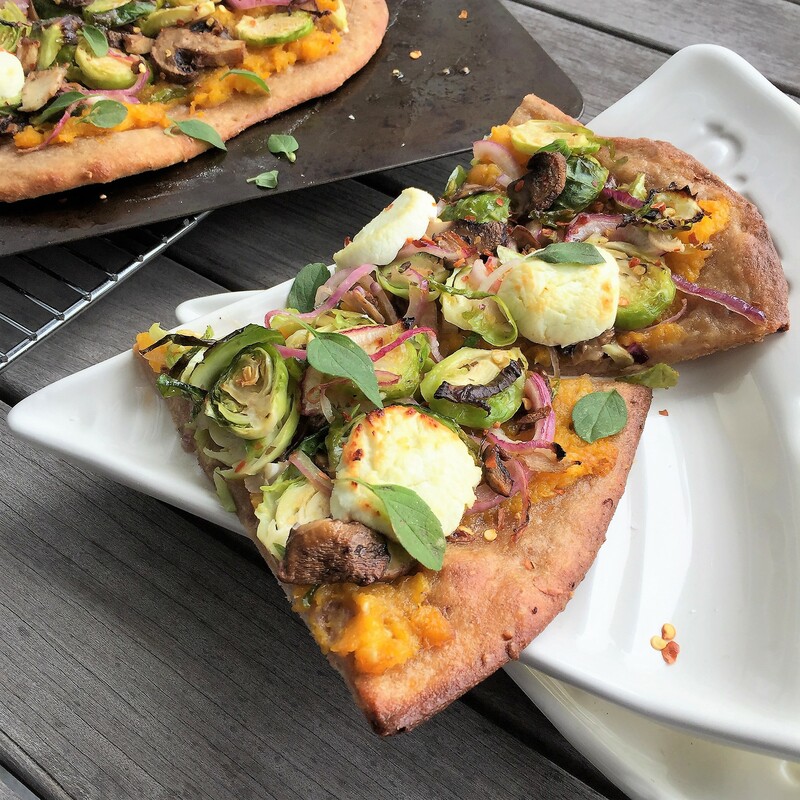 Once you bake up this pizza, make it complete by pairing your slice with a protein-packed pick, like a bean salad side or hummus appetizer. Or simply indulge on two slices! Then slowly savor every bite! Place a stick-resistant large baking sheet, pizza pan or pizza stone in 500°F oven to preheat. Meanwhile, heat 1 tablespoon of the oil in a large cast iron or other stick-resistant skillet over medium. Add the butternut squash and 1/4 teaspoon of the salt and cook while stirring occasionally for 8 minutes. Add the garlic and cook while stirring occasionally until the squash is cooked through, softened, and lightly browned, about 8 minutes more. Transfer to a medium bowl and roughly smash with a potato masher; set aside. In a large bowl, toss together the mushrooms, black pepper, and 1 1/2 teaspoons of the oil until combined. Add the brussels sprouts, onion, hot pepper flakes, remaining 1/2 teaspoon salt, and 1 1/2 teaspoons of the oil and toss until combined; set aside. Lightly flour a clean kitchen surface. Shape dough with a rolling pin into a 14-inch round crust. Carefully transfer the prepared dough to the preheated baking sheet. (Hint: Gently roll up dough over a rolling pin, then unfold onto the baking sheet.) Quickly brush the rim of the crust with the remaining 1 tablespoon oil. Dollop the pizza dough with the mashed squash, then spread like it’s the “sauce” of the pizza, leaving about 3/4-inch rim. Top with the brussels sprouts mixture and goat cheese. Bake until the crust is crisp and richly browned, about 16 to 18 minutes. Drizzle with additional extra-virgin olive oil, if desire extra richness. Sprinkle with additional hot pepper flakes, if desire extra heat. Slice into 8 pieces, garnish with fresh basil or rosemary, and serve. Yum! The perfect fall pizza! !